Have you ever photographed a shooting star? Have you ever thought you could photograph a shooting star? Personally, the thought never crossed my mind and if I had been asked the second of these two questions I most likely would have answered no. Why? Because the odds are very very small, unless you photograph during the night of the Perseids meteor shower, or on another special night where shooting stars are plentiful. Well, Thomas Even, the author of this essay, did photograph a shooting star on August 18th. This is actually during the Perseids Meteor Shower which takes place between mid-July and mid-August. Thomas created this photograph at dawn. His goal was not to photograph a shooting start but rather to photograph sunrise over Lake Martin. As it turned out, the photograph he brought back from this memorable shoot is of a Shooting Star over Lake Martin. I can hear your question as I type: was it luck? Well, maybe or maybe not. It all depends how you look at it. To find out let's read Thomas' narration of how this unique photograph came to be. 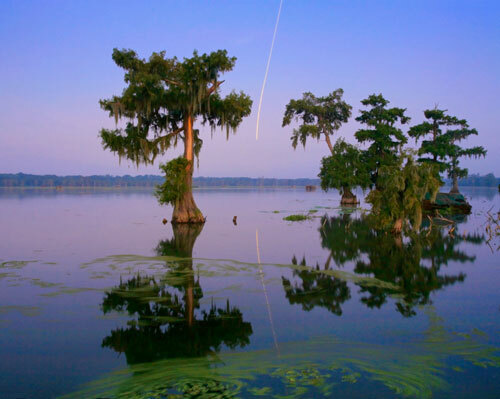 One of my favorite landscape locations close to home (Lafayette, Louisiana) is Lake Martin. In the spring thousands of Snowy Egrets and Roseate Spoonbills migrate to the Lake for breeding season, not to mention the rare breed of bird photographers. While I enjoy wildlife photography, landscape photography is where my passion lies and this location has some of the classic Louisiana landscapes. My weekend ritual is to arrive well before sunrise to set up and contemplate compositions. Twilight brings a wonderful soft pastel light perfect for cypress silhouettes. The morning of Saturday August 18th I arrived approximately one hour before sunrise and set-up the tripod and camera on a point next to the boat launch. After taking a few shots using the pier light to illuminate some foreground elements, I moved into position for a composition using a group of cypress trees against the western sky. It was a clear morning and the western sky had a magenta hue, I often shoot morning twilight in the western sky because of the lower contrast quality of light. By this time a couple of local fishermen were preparing to launch into the lake for an early start after a limit of largemouth Bass. I overheard one of the fishermen ask the other “what is he taking a picture of in the dark?” I had to laugh, this is not the first time I have heard that comment. Just before depressing the shutter I waited for the fishermen pass through the frame between the camera and cypress trees disturbing the water, I like to experiment with motion and expected the waves to add interest to the reflections. Using a long exposure allowed me to record the foreground vegetation movement as a swirling pattern of green, thereby adding interest to the image. August in southern Louisiana translates to hot and humid (100% humidity to be exact) causing condensation issues with my air conditioned camera gear. So because I forgot to pre-heat the camera and lenses I was blowing air on the front lens element with a hurricane blower to prevent fogging during the exposure and did not even see the shooting star streak across the sky. It was not until getting home and reviewing the images on my computer that I noticed the meteor shooting through the composition, as if intentionally framed with a reflection. Based on the angle of flight and brightness of the nose, I think the meteor must have fallen just as the shutter closed. 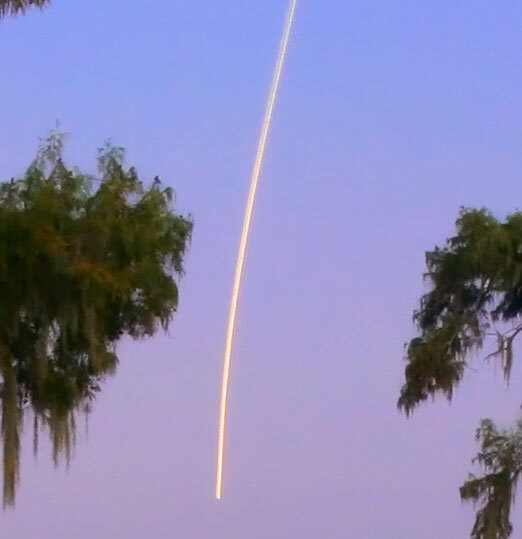 Needless to say I was excited; I have never seen a shooting star image quite like this with a landscape composition. and Canon 17-40 F/4L lens zoomed to 28mm. original 12.7mp Canon 5D image. My first thought was how incredibly “lucky” I was in not only capturing a shooting star, but to have the streak of light fall into a pleasing composition. The more I thought about the image, the more I realized that yes luck did play a role in the image, but preparation and persistence were also contributing factors or proactive means of “being lucky”. Let’s take a moment to look at an analogy using these fishermen. Assume they caught an ice chest of fish that day 3 times larger than any other boat and to top off the day caught the Louisiana State record Bass. Was it all luck? (Other fishermen in the lake that fish once a year might think so) What if these guys are always the first in the water and last off, they fish the area every week and know where the fish are biting this time of year. They watch the weather patterns and plan trips in optimum weather. I think most would agree successful fishing trips are a combination of preparation, persistence and maybe a little luck. This was not the first time I photograph this particular composition, as a matter of fact I have photographed over 55 mornings at Lake Martin over the past couple of years. This persistence has allowed me to get shots with different atmospheric conditions, varied lighting quality and now a shooting star. On the morning of August 18th I took several long exposures during twilight which increased the probability of capturing the meteor (although I was not looking for one). Photography, good photography that is, is the result of deliberate and focused work. Luck may, and does, play a role in the results, but the uncontrollable nature of luck only plays in your favor if you have taken care of controlling all the other variables personally. ‘Luck favors the prepared mind,’ said Louis Pasteur. Let's be prepared, and then let luck come in if it pleases. The bottom line is that if we are not out taking pictures it is a sure thing that luck will not find us. I believe one of the ingredients to landscape photography that can have a lasting impact on viewers are images containing rare events in nature; be it interesting weather, light or even shooting stars. We are showing the viewer something new and different.